The latest HALCON version, HALCON 18.11, was released in November 2018. It was officially introduced at VISION 2018 and, amongst other things, includes new AI technologies, specifically from the fields of deep learning and Convolutional Neural Networks (CNNs). HALCON 18.11 is available in two editions: Steady and Progress. While the latter is available as a subscription with a six-month release cycle, the Steady edition – as successor of HALCON 13 – is offered as one-time purchase. Deep-learning-based image classification allows to easily assign images to trained classes. The low labeling effort enables particularly short set-up times, and applying the classifier to new data is especially fast. With semantic segmentation, trained defect classes can be localized with pixel accuracy. This allows users to, e.g., solve inspection tasks, which previously could not be realized, or only with significant programming effort. Object detection localizes trained object classes and identifies them with a surrounding rectangle (bounding box). Touching or partially overlapping objects are also separated, enabling object counting. To maximize its potential in industrial environments, HALCON’s deep-learning-based image classification, semantic segmentation, and object detection can be performed on GPUs, as well as on x86 CPUs. With HALCON 18.11, the data code reader for ECC 200 codes has been improved. The overall recognition rate could be increased by 5 % (data based on our internal ECC 200 benchmark consisting of more than 3,700 images from various applications). In addition, the ECC 200 reader is able to read codes with disturbed quiet zone now. Moreover, codes against complex backgrounds can be found and read faster and more robustly. HALCON now features optimized edge detection, which improves the ability to reliably read bar codes with very small line widths as well as strongly blurred codes. Moreover, the quality of the bar codes is also verified in accordance with the most recent version of the ISO/IEC 15416 standard. HALCON features an improved version of the automatic text reader, which now detects and separates touching characters more robustly. HALCON 18.11 introduces a new data structure “dictionary”, which is an associative array that opens up various new ways to work with complex data. For example, this allows bundling various complex data types (e.g., an image, cor­re­spond­ing ROIs and parameters) into a single dictionary, making it easier to structure programs when, e.g., passing many parameters to a procedure. Dictionaries can also be read from and written to a file. This allows an engineer to bundle all information necessary to reproduce a certain application’s state (e.g., camera calibration settings, defective images, and machine parameters) into a single file. This file can then easily be shared with an machine vision expert for offline-debugging. With HALCON 18.11, HDevelop can display detailed information on most important handle variables. This allows developers to easily inspect the current properties of complex data structures at a glance, which is extremely useful for debugging. Double-clicking a handle variable now returns all para­meters associated with the handle and their current settings. For example, the user can now easily examine parameters of a data code handle, such as “polarity”, “symbol type” or “finder pattern tolerance”, as well as complex parameters that carry multiple key-value pairs, like for example the camera parameter of a 3D shape model handle. HDevelop provides a new library export that makes the use of HALCON procedures from C++ and .NET as easy and intuitive as calling any other C++/.NET function. This is possible via a wrapper that encapsulates the necessary HDevEngine API calls. This new library export also generates CMake projects which can easily be configured to output project files for many popular IDEs, such as Visual Studio. The new functionality is accessible from the HDevelop GUI and via command line interface. HALCON now makes it much more comfortable to work with handles by clearing these automatically once they are no longer required. This significantly reduces the risk of creating memory leaks and makes writing “safe code” much simpler. HALCON now offers a method that fuses multiple 3D point clouds into one watertight surface. This new method is able to combine data from various 3D sensors, even from different types like a stereo camera, a time of flight camera, and fringe projection. This technology is especially useful for reverse engineering. HALCON now offers optimized functions for surface-based 3D matching. These can be used to determine the position of objects in 3D space more reliably, making development of 3D applications easier. In addition, HALCON now also includes a new helper procedure that allows developers to quickly inspect and debug parameters and results of a surface-based matching application. A new camera model within HALCON now allows the corrections of distortions in images that were recorded with hypercentric (also known as pericentric) camera lenses. These lenses can depict several sides of an object simultaneously, thus enabling a convergent view of the test object. 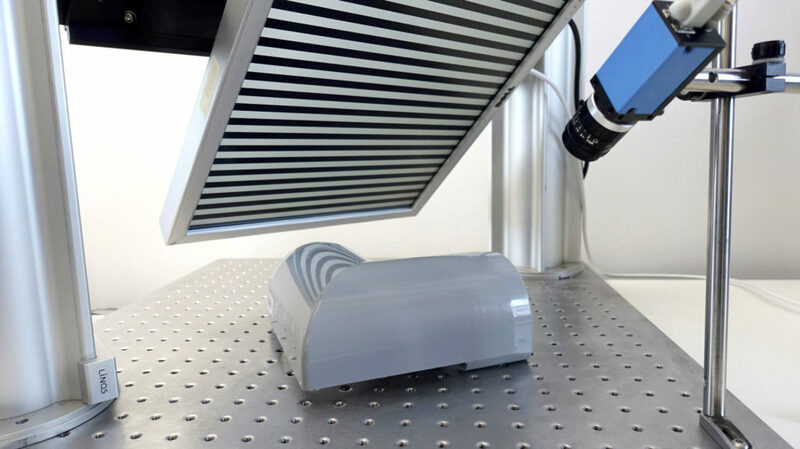 With this technology, users only need a single camera system for inspection and identification tasks, e.g., the inspection of cylindrical objects. HALCON 18.11 includes new operators, which enable the user to inspect specular and partially specular surfaces to detect defects by applying the principle of deflectometry. This method uses the reflections on specular objects’ surfaces by observing mirror images of known patterns and their deformations on the surface. HALCON 18.11 introduces the Hilscher-cifX interface. This allows HALCON to communicate with almost all industrial field bus protocols via Hilscher cards. Among others, CC-Link, EtherCAT, EtherNet/IP, PROFIBUS, and PROFINET are supported.